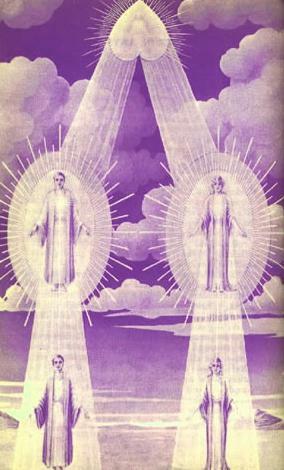 Illustration from the 1937 The Voice of The "I AM"
With the first stage of Creation thus being completed, the next step was the creation of "garments" for the "Spirit Sparks" (God Flame Individualities of the "I AM") [*] which, as we have seen, having been drawn from the Universal. Just as an individual needs and uses "garments" for the proper function and well being of his physical form, so do the "Spirit Sparks" (God Flame Individualities of the "I AM") [*] after leaving the Higher Realms. In the following, we give excerpts, taken from Addresses given by no less Authentic Authorities on the subject than God Meru - Manu of the Sixth Root Race, Chohan Saint Gemain, Lord Maitreya - the present Buddha, and Chohan El Morya. Each One of Them treats the subject from a different angle. ". . . These 'Spirit Sparks' (Great God Flame Individualities of the "I AM") [*] project into Universal Light two glorious Immortal Three-fold Flames. Around These there is formed a great White Fire Body (Electronic Body) [*] for the Two Divine Complements - male and female - all still in the Realm of Perfection. These two Divine Complements, (Twin Flames.) [*] as They dwell in that Realm of Perfection, have free will and they can choose to descend through the entire Seven Spheres (Seven Realms of Nirvana / Akasha / Causal Body / Atmic) [*] where Perfection exists, lingering as long as they desire, in each of the Spheres, and assimilate as much of the instruction as they desire. In the following, Saint Germain is giving us another facet of this interesting but little known subject. ". . . It must be borne in mind, that man Individualized, originally stood before God as a White Fire Body, having the form of a perfect Circle of Light. With the projection of the White Fire form into Twain, each of the two projections of this White Fire Body manifested as an individualized I AM Presence in the Heart of the Great Central Sun. It should be understood that the twain, who descended from the White Fire body originally, composed of the whole Circle, are Twin Rays, one part of the complement (primarily) [*] manifesting the Masculine nature of Deity, the other the Feminine. At times, one of these elected to remain in the Higher Octaves without descending through the dense spheres, and then, in many cases, both descended to participate in the realm of experience, moving through the octave of consciousness into the present hour. The descent of the Christ is scriptually referred to in the phrase "Lo! 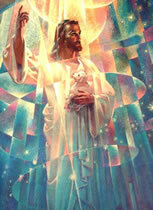 I come to do Thy Will, O God!" 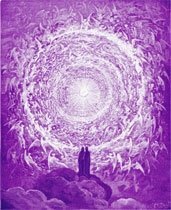 (Hebrews 10:7-9) Thus the Immortal Power of Life, descending from the Godhead as Man, the Individualized Monad is possessed with the Holy Intent of fulfilling the Divine purpose through the Ritual of the Ascension. . . "
Continuing Lord Maitreya, the Buddha, presents it from a different perspective.
" . . . When the God-Parents took the responsibility for evolving a race upon the planets of our system and had "drawn forth" (invited) [*] the billions of "Spirit Sparks" (Great God Flame Individualities of the "I AM") [*] from the Great Central Sun of our System, They gave to you and each one, bodies, molding each Divine Archetype from the White Fire Beings and then the Electronic Presence, (D) like unto Their Own Image and likeness and each such beautiful Presence was the 'Only Begotten Son'! "The purpose of the creation, as well as the sustenance of any system of worlds, is to allow each I AM Presence Who stepped forth from the Universal Heart of God to unfold a Spiritual Nature and become Master of energy and vibration through the conscience of control and use of his own creative faculties of thoughts and feeling. "Thus each Individualized God Presence is truly the Son or Daughter of God and Heir to all that the Father hath, with free will to create through thought and feeling the beauty and perfection of the Father. The individualized God Presence contains within Itself all the Light, Love, Wisdom, Power, Beauty, Opulence, Purity, Harmony and God Qualities of the Father." On the other hand, others, using their free will, decided not to project two I AM Presence (Electronic Bodies), [*] and preferred to remain One, going through the Seven Spheres single. B The Great Divine Director, in an address given to the students some years back, referring to the words "I AM" said that these words are not of recent human invention, as some may think, but have come down to present time from the beginning of man's coming to Earth. Proof of that, He said, is found in the archives of the Royal Teton where the records of all past civilizations have been kept, exactly as they were originally written in their respective language, and the words "I AM" are found there as they are in use today. He added that these two words are the Power of God.
" . . . As We have declared, within your hearts and your minds will We write Our Law! The Law of God - The Law of Adoration is reflected in the words " I AM," for "I" Alpha, the ONE Who signifies the Source - the numeral 1, and the word I. Omega, My Beloved, represents the "AM" and is therefore called A-may-ga. I - Amega - the Beginning and the Ending. . . "
" . . . When the outer self has completely absorbed and put into practice all the perfection in which the I AM Presence functions, the Cosmic Law rushes that I AM Presence to a Higher Sphere, preparatory to the new demands made by the outer self. You can see then, that the I AM Presence advances according to the inner prayerful devotions made upon it by the human self, and that this glorious patient, ever-listening ONE is most eager for the cooperation of the outer self. . . "
" . . . The most evolved the personal self, the higher is that one's I AM Presence in the Octave of Perfection, and by reason thereof, does it draw more of the substance of the higher Levels, through the Electronic Light into the Holy Christ Self within the human Heart. . . "
D " . . . When We speak of Life, We speak of what the scientific world calls Electronic Energy. I AM a Cosmic Dispenser of Life, and therefore know the actual reality of that Electronic Substance. Men consider life wasted, life boring, etc., because they do not understand the very nature of that glorious Gift of Life, from God's Heart. E When the word "personality" is used by the Masters, it does not mean the "I AM Presence" but the "soul" as it was developed by man in his many re-embodiments and is manifested now in its totality as his "personality." For a better understanding of this, let's bear in mind that man in each and every re-embodiment, creates for himself a "personality" which is the result of all the experience of that particular life. The "soul" is the totality of the memories of all embodiments of the individual on this planet. This "soul" however, should not be confused with the I AM, which is man's Real Eternal Identity.